Let me start by saying that I don’t practice yoga regularly. Quite frankly, I don’t have the time. I have a number of other activities and hobbies that make it very difficult to include yoga in my schedule. But if I happen to have an opening in my schedule (which rarely happens), I work in a yoga class. I’ve done it a few times and thought it was great. But don’t follow my example; yoga may be a great workout that could not only improve your overall health (which I wholly believe it can), but it could also boost your mood. Yoga has been linked to improved mobility, better blood circulation and, most importantly (in my opinion), reduced stress. Yoga is sort of like a two-in-one punch against stress. It not only allows you to block out external distractions and collect yourself, like meditation, but it also lets you stretch your body, allowing it to relax and improve physiologically. One of the best things about the teachings of yoga is that you can use some of the methods off the mat. They can be taken outside and used whenever you might feel stressed and need to calm down. One of these methods, which is a key component of yoga, is controlled breathing. When you feel stressed, your body naturally reacts with a faster heartbeat and shorter, shallower breaths. Yoga, on the other hand, requires long, deep breaths to fill the lungs and distribute adequate oxygen throughout the body, allowing your heart rate and blood pressure to return to normal. In turn, this creates a calm feeling. Focusing on breathing also allows you to block out the stressors surrounding you. It keeps your brain occupied, so the problems on your mind begin to vanish and you’re thinking solely about breathing. 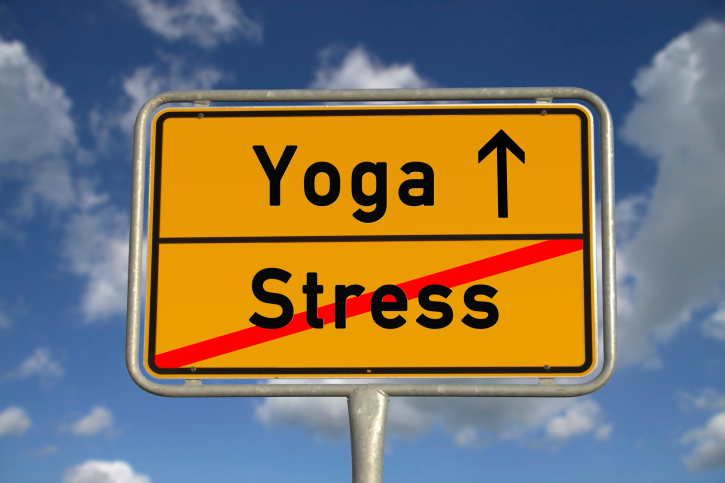 Another good parallel between yoga and dealing with everyday stressors is to accept the situation and lean in. When you’re on the yoga mat and are trying to get deep into a position, you might experience a strong stretching sensation. It’s not exactly pain; it might be a tad uncomfortable, but you continue to hold it because you know it’s a good thing. When there is something that’s making you uncomfortable or creating stress in your life, don’t avoid it. Instead, address it, lean in, and deal with it. You can’t expect to see any improvements in your stress levels if you simply choose to step away and ignore it. If you haven’t tried yoga before, I’d recommend joining a beginner class. Depending on your fitness level, I’d also suggest avoiding the “hot yoga” trend, as it can be quite taxing on your body. And remember, like anything, it will take time and effort to get the most benefits. In the end, though, your body and your mind will thank you.